Cleaning body side moldings to remove the yellowing and discoloration. Pictured Above: As you can see from the shots above, the difference between the before and after of cleaning the body side moldings is dramatic! 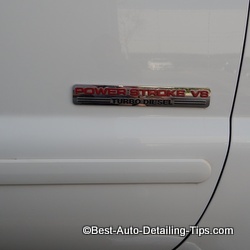 I can promise you that you will wish you had done this sooner once you see how much newer your car or truck will look after the yellowing and discoloration of the body side moldings have been cleaned to perfection. Back in the day, removing or cleaning the discoloration from side moldings required aggressive chemicals and techniques. 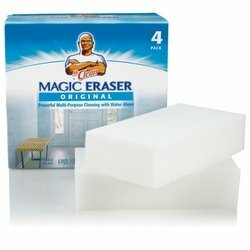 Now with the invention of the amazing Miracle Eraser from Mr. Clean, and along with one of my favorite cleaners listed below, the process it incredibly easy and straightforward. I consider the Mr Clean Magic Eraser "tool" the 8th wonder of the world! 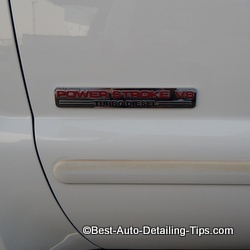 It has so many amazing uses not only within the world of auto detailing but around the house. One of my favorite degreasers and heavy duty cleaners. The actual chemical I use in the video on this page. Versatile product that can be custom diluted to suit your needs. As a rule I dilute it down 4:1 for exterior heavy duty jobs and 10:1 for interior cleaning. (yes, I actually use this on many different interior cleaning jobs when traditional all-purpose cleaners prove ineffective. You can see my full write up of the super-degreaser at that link. Concentrate; mix to desired strength based on label instructions. For the cleaning body side moldings, I use Simple Green straight (neet) without diluting it down with water. Not a traditional cleaner or degreaser within the world of auto detailing, but still a fabulous cleaner with so many uses! Not the degreaser I use in the video, but that degreaser only comes in a gallon size and not suitable for most people. If you insist on getting the exact degreaser I use in video, you can see my best degreaser here. These (2) products make a deadly combination against many forms of dirt, scuffs, and misc. marks that can be found on both the inside and outside of your car. Use the video above to help in what is really a very simple and straightforward process of cleaning body side moldings.